This page may require cleanup to meet basic quality standards. The specific problem is: This page contains information for both the original game and the reboot. You can help by modifying the article. The discussion page may contain useful suggestions. This page is for the original 1987 game. For the 2005 reboot, see The Bard's Tale (2005). All digital versions include The Bard's Tale, The Bard's Tale II: The Destiny Knight, The Bard's Tale III: Thief of Fate, and The Bard's Tale (2005). 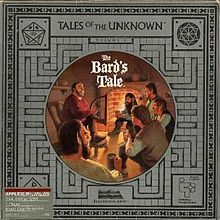 Digital versions of The Bard's Tale (2005) include the Apple IIgs version emulated in a custom KEGS build. Using MESS allows for save states, windowed mode, control customisation and many other enhancements. Download MESSUI and extract it. Make a roms folder in the MESSUI folder. Download apple2gs.zip from the latest MESS BIOS Collection and put it in the MESSUI roms folder. Launch the game through The Bard's Tale (2005), then exit. Go to the Save game data location location and copy bt1d1.2mg and bt1d2.2mg into the MESSUI roms folder. Run MESS and select Apple IIgs (ROM03). Go to the Device View tab and mount bt1d1.2mg and bt1d2.2mg as Floppy Disk (Sony). Run Apple IIgs (ROM03) to start the game. Choose Slot 5, Drive 2 when prompted for a characters disk. To configure the output scaler, Vsync, etc. right-click Apple IIgs (ROM03) and choose Properties. Toggle with Alt+↵ Enter (when using DOSBox or MESS). When using MESSUI, fullscreen borderless is the default. Use MESS for digital versions; false for DOS version. This page was last edited on 15 December 2018, at 04:22.